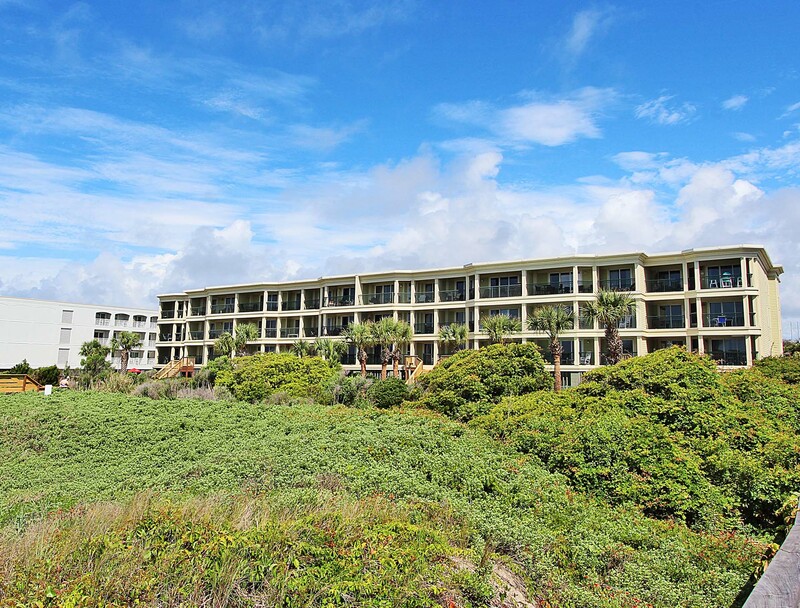 BEAUTIFUL OCEANFRONT CONDO WITH DIRECT BEACH AND POOL ACCESS FROM YOUR PRIVATE PORCH! A tropical setting w/views of palms & the ocean from the porch! Crisp white cabinetry, granite countertops, and tile flooring in fully equipped kitchen. Dining area has seating for five, with four additional stools at the counter. The living room offers beautiful furnishings including a queen size sleeper sofa, a HDTV, and access to a private balcony that leads down to the complex pool and beach. 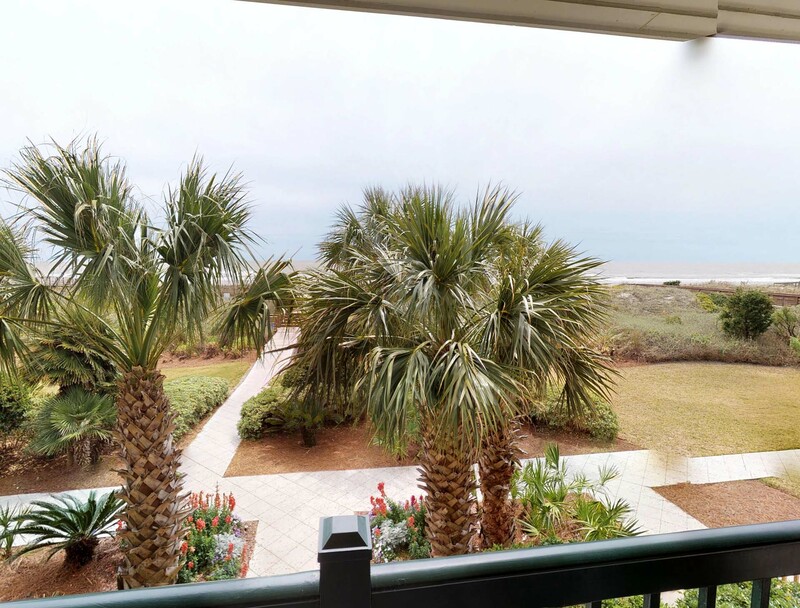 The master bedroom boasts new tile flooring (Fall '14), a king bed, HDTV, sitting area w/access to the balcony and the beach, and full private bath w/a garden tub and walk-in shower. The first guest bedroom offers a queen bed, television, and shares a full bath with the hall. The second bedroom offers a pyramid bunk (full bed on bottom, twin on top), and a trundle (twin), television with VCR, and shares a bath w/walk-in shower w/hall. 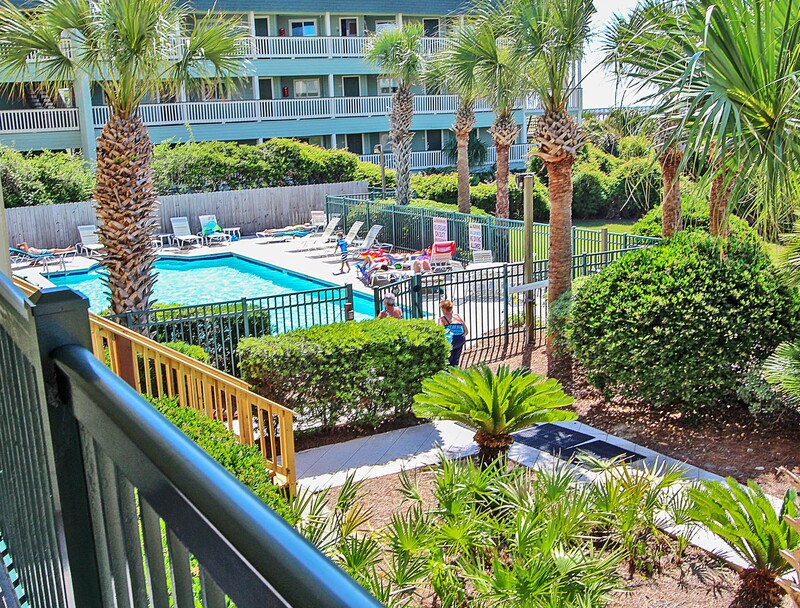 Located in the heart of IOP, near lots of shopping and restaurants. Access to complex pool. Linens and Wi-Fi included. No Smoking. No Pets. Bedroom 1: Queen bed; shares bath with hall; TV. Bedroom 3: King bed; private bath with garden tub & walk-in shower; TV; access to balcony. Dining table seats 5 with additional seating for 4 at bar. 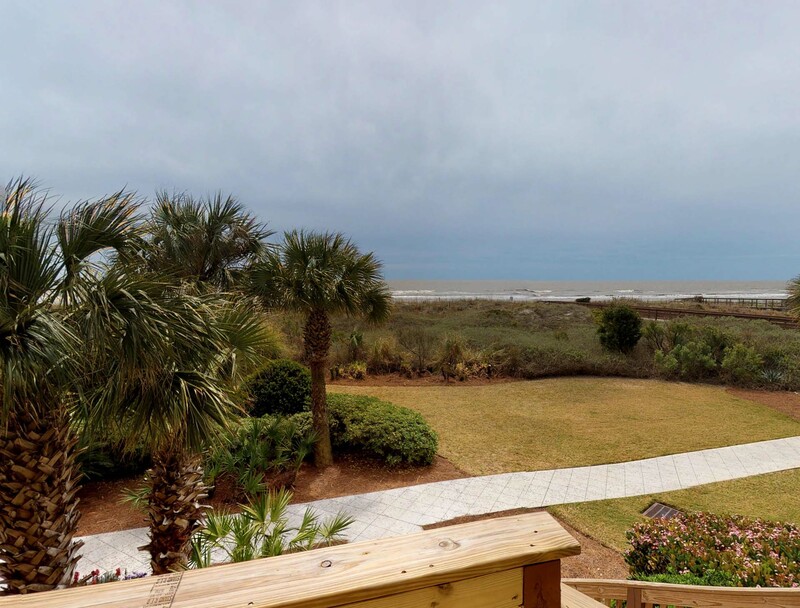 *This is a Saturday-Saturday rental from 6/1/19 to 8/24/20 3 night minimum in off season. The rental was in a great location. It is ok inside. Beds could use updated linens and mattresses. When i arrived i had to buy and replace light bulbs as there were many dead bulbs in lamps. Remotes needed new batteries as well as thermostat. Oven does not hold to temperature . I had to buy a thermometer to use oven. The kitchen is adequate and property is in a great location . The front stairs are very nice feature to access the beach. I enjoyed my stay on Isle of Palms. Very nice and spacious condo. Great view!! Clean and updated rental! My family is already to rent it again! Will be back! Thank you for taking the time to leave a review and we look forward to having you back with us soon. We stayed for 3 nights and 4 days. The property was clean and well maintained. It provided plenty of room for 8 girls in their mid thirties. Bonus were the three full baths so we could all get ready for dinner. The location of the condo was in a great spot. It was easy to get to the pool, beach, and restaurants. Very relaxing and enjoyable stay. Would return in a heartbeat. Generally fine. other guests apparently had a fight at the pool and broke a glass table which ended up in the pool. the pool was closed for 2 full days. very inconvenient. Called island realty to inquire. didn't care. didn't offer to call the company that services the pool. very rude and inconsiderate in trying to make sure all 23 of us had a good experience. was not very happy with there indifference. Thank you for taking the time to leave a review. I have passed it on to the management as that is very out of character for the staff of Island Realty. Our managent will definitely look into it. Great beach location. Can walk to everything on the island. Would recommend Ollies across the street, not Coconut Joes. Condo was in a great location to beach and pool. Plenty of room for 6 adults and 1 child. Thank you for taking the time to leave a review. We are so glad that you enjoyed your vacation and we look forward to having you back with us soon. We had an awesome vacation with this rental! Great location...great access to the beach....great accommodations.... Love the cooking utensils in the kitchen...we easily made dinner for our crew (spaghetti) Hope to stay here again in the future! The condo was wonderful! Clean, well kept and right on the beach with great views! What more can you ask for?! We had a great time and hope to come back! Thank you! I would like to thank you for taking the time to share your experience at Ocean Blvd. 1140 #104 and hope you had a safe trip home. It is always Island Realty's goal to provide guests with quality accommodations and superb service. We value your feedback as it lets us know the areas were we need to improve, so we can provide an even better vacation experience. Once again, thank you so very much for taking the time to share your experience with us and we hope to see you again soon! Excellent. Highly recommend 1140 #104 to anyone. Wonderful location--and well maintained. This home is amazing and would be great for family use. It comfortably slept 6 adults and it was super convenient for each bedroom to have a bathroom. This unit could use a bit of updating, but each guest felt comfortable. Thank you so much for taking the time to share your experience. Your comments and feedback will be shared with the decision makers for Ocean Blvd. 1140 #104. Your feedback is incredibly valuable to us and we sincerely thank you for your time and efforts. We hope to see you again soon! We had an absolutely wonderful stay! We liked this unit (#104) a lot: the furniture, layout, and amenities are all good. Wireless wifi worked well, which was very important for us. This unit and it's location are great. The only complaint that we had was that there were lamps without light bulbs and that all of the bulbs in the fixture over the dining room table were burned out! This condo was very comfortable, tastefully decorated, and had all the comforts of home. The view was gorgeous. Will definitely come back. We loved Ilse of palms and the place we stayed was great. The condo was lovely and in great shape. The location was perfect. I would definitely come back again. 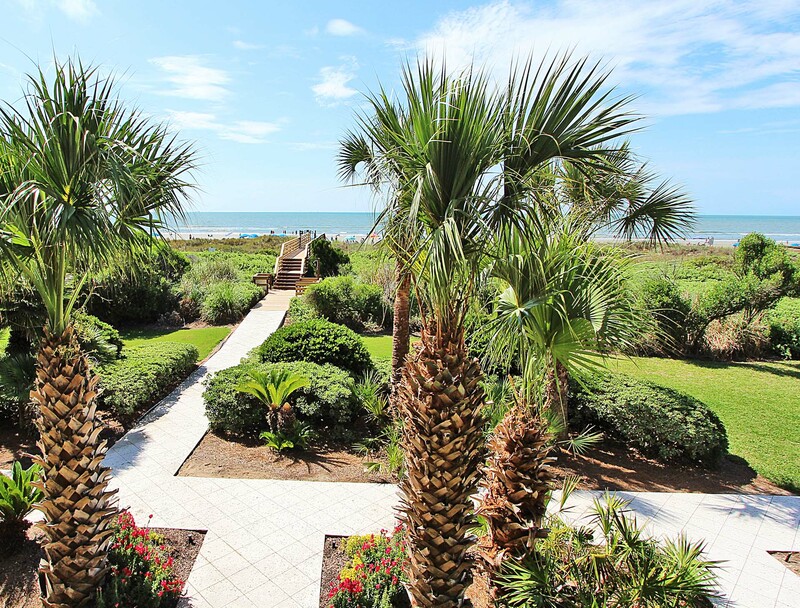 Isle of Palms is like paradise. It was a wonderful experience. Condo was perfect for my husband, my parents and myself. We enjoyed the area too, especially Banana Cabana! !